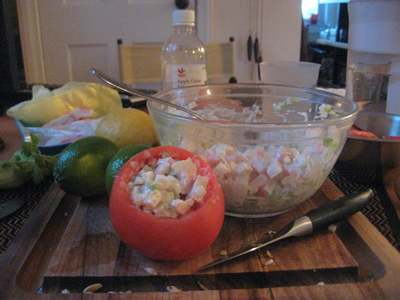 Hazy Hot and Humid… So, yesterday I mentioned making a chicken salad stuffed tomato. Well, I decided to stop off at the fish shop on the way home and got a great deal on crab meat. So, instead of chicken salad stuffed tomatoes, I made crab salad for them. I like to make these easy meal items that go straight from the fridge to the plate on these hazy, hot, humid days. Start by cutting the crab meat into modest chunks. Cut the lime in half and squeeze the juice over the crab meat. Take a butter knife and shave off some of the lime pulp into the crab meat. Combine this thoroughly. Then add the minced celery and onion, then cut the leeks lengthwise and chiffonade and add the shreds to the crab. Now, add the mayo and mix thoroughly. Take each tomato and hollow them out. I usually fine that one of those serrated grapefruit spoons works well for this task. Save the innards for making salsa, or chunked into a side salad. Now, stuff the crab salad into the tomato and store them in the fridge till you are ready to serve them up. This entry was posted in Salad, shellfish and tagged crab, dinner, food, grapefruit spoons, lime, long island, picnic, pound crab meat, red onion, Salad, seafood, sustainable seafood by chefbill. Bookmark the permalink.